Rae Catanese is more than just a real estate agent – she is a Realtor, prominent blogger, social media expert and, most important, a compassionate advocate for home buyers and home sellers. Her intimate knowledge of the area informs her work, as she grew up in St. Pete and Clearwater and now lives in Tampa. She specializes in high-end properties and luxury homes throughout the region, and she also is adept at handling relocations. Her knowledge of Florida’s Gulf Coast and the greater metropolitan Tampa area enable her to identify just the right neighborhood for newcomers to the area. Licensed since 2002, and a Realtor at RE/MAX Bay to Bay, she’s built a reputation as a high-tech social media maven. Blogging, SEO and creating winning content are her strengths. Author of The Tampa Real Estate Insider Blog, which she started in 2006, she has parlayed that early social-media resource to become a top-ranking must-read for home buyers and sellers looking to learn about hot topics and trends in the Tampa and regional real estate market. Helping readers navigate the world of Tampa real estate, she shares market statistics, home-buying tips and pointers for selling homes. She also recaps case studies of tough-to-move properties that she ushered to the closing table. Rae excels in providing overall branding and social media strategy focused on industry trends. She creates landing pages and email marketing campaigns, trading on her mastery of trends in search-engine traffic, analysis of visitor intent and research on keyword usage. Rae is a frequent expert on real estate interviewed by local and national media outlets including the Tampa Bay Business Journal, HGTV – Frontdoor.com, The St. Petersburg Times, Forbes.com, TBO.Com and WTSP 10 News. How a Buyer’s Real Estate Agent Can Help You and Why you Need One! My readers are the backbone of my business. More than 80 percent of my clients find me through my blog, and it’s important for me to know that I’m providing you all with the best information out there. My goal is to create insightful, relevant content that will make the home buying or selling process a breeze. If you are thinking of buying or selling a home in the Tampa, St. Petersburg or Clearwater areas, then this blog is for you. I typically post articles once a week. To make sure you don’t miss my newest posts, you can subscribe here! Have a particular question about Tampa Bay real estate? I’m always open to answering any questions you may have. You may contact me here. 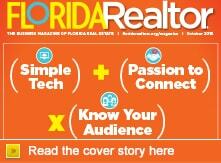 Four Realtors found the formula for marketing magic by mixing technology with in-person relationships. So You Say You Want a Mortgage? Rae is an extremely knowledgeable and diligent real estate professional always considering her clients' needs first. Her expertise in the local residential real estate market is second to none.